Music is an integral part of Indian Culture and is as old as mankind. The evolution of music can be traced by a systematic study of Granthas (treatises) belonging to Sacred literature and Secular literature. There is no single ancient literature which does not speak about music. They throw light on the origin and development of music which can be traced through three phases- Ancient, Medieval and Modern phases. Music in ancient period was looked upon as sacred and religious form. They were used for rituals and temple worships. Music was a part of Vedic rituals. During medieval period music was spread among common people and became more secular in nature. The foreign invasions influenced the age old sacred form resulting in the bifurcation of Indian music into Karnatak and Hindustani music systems. The invasion of Mughals not only did an impact on the political affairs but also on the cultural front. 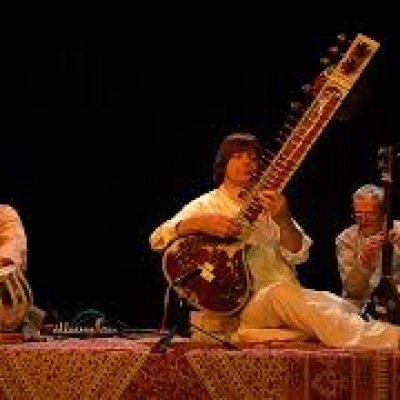 Northern part of India was influenced by the Persian music and some of its nuances were incorporated in the Indian system and as a result Hindustani music emerged having a style of its own. Karnatak music which prevailed in Southern parts of India stuck to the stable roots of ancient music but of course with improvisations over the change in time. The works on theory and practice of music composed during this period applies to both the systems. Modern period concentrates more upon the practical applications. Music became totally an art form but with the tinge of divinity. A full formed music emerged with the contributions of many scholars, musicians and composers who mainly emphasised on the techniques of Raaga developments, Taala structures, creating varieties of Compositions, Performances on both vocal and instruments in both systems of Indian music- Karnatak and Hindustani music. The murmur of water, the whistle of wind, the hiss of flames, the rumble of earth and the thunder of sky formed the elements of sound from which speech in turn music evolved. Singing marks the beginning of music in all nations. The cries of birds and beasts might have attracted the primitive man and the man imitated those sounds to denote alarm, passion, pain and joy. As the man began to produce these vocal sounds, to denote alarm, he also found that the claps or the drum beat could be effectively used to draw attention or to articulate rhythm. In this manner shout might have been the inspiration for vocal music and a clap for percussion instruments. The atman (soul) desirous of speaking out of its intention excites the mind; and the mind operates on the vital heat of the body by setting the air in the Brahma granthi, rises up and produces sound through the navel, the heart, the neck, the head and the face”. This sound is the basis for the origin of vocal music. Classical music called Shastreeya Sangeeta in Sanskrit, means music that adheres to the principles or rules. Classical music is not just artistic or entertaining it also sublimates man’s mind, body and soul thus making him Jeevan mukta (liberated soul). The saying goes as just like Tapas (meditation) is for Krita yuga, Yagna (religious sacrifice) for Treta yuga, Pooja (worship) for Dwapara yuga, Sangeeta (music) is for Kali yuga. The ultimate goal of music is the union of Jeevatma (soul) and Paramatma (God). Apart from devotion, Indian music emphasizes morals through the medium of art. The Indian scriptures call God as Naada Brahma and music as Naada yoga. Naada the musical sound give rise to Srutis (micro tones) and these to Swaras (notes) and in turn to raagas (melody). Anaahata Naada which is often referred to the music of the spheres heard without the man’s effort. This is audible only to yogis. Music is an integral part of Indian Culture and is as old as mankind. The evolution of music can be traced by a systematic study of Granthas (treatises) belonging to Sacred literature and Secular literature. There is no single ancient literature which does not speak about music. They give references to music with respect to spiritual, religious and sociological aspects. Music in ancient period was looked upon as sacred and religious form. According to ancient scriptures Sangeeta (music) and Saahitya (literature) are said to be the two breasts of goddess Saraswati. 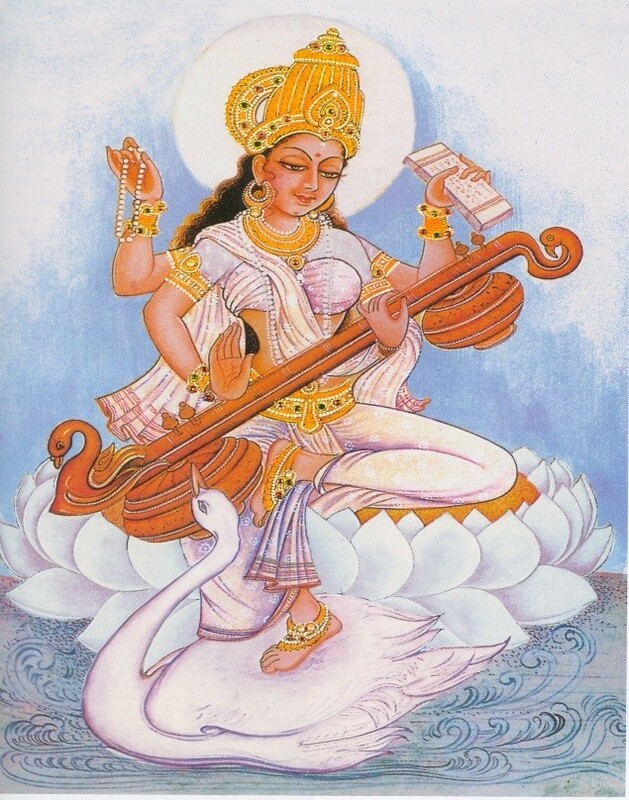 Music is also called Panchama Veda or Gandharva Veda as it was practised by celestial nymphs called Gandharvas. The pranava naada (primordial sound) OM is said to be the source of music. The recitation of Vedic hymns marks the beginning of classical music. Initially the chanting started with a monotonic recitation known as Archika gaana (singing). Later it paved the way to two toned – Gaathika followed by Saamika with a higher Swara (note) resulting in three toned recitation. Rig vedic hymns were recited from one to three notes. The triad comprised of a higher swara called Udatta, lower- Anudatta and the third sandwiched in between- the Swarita. 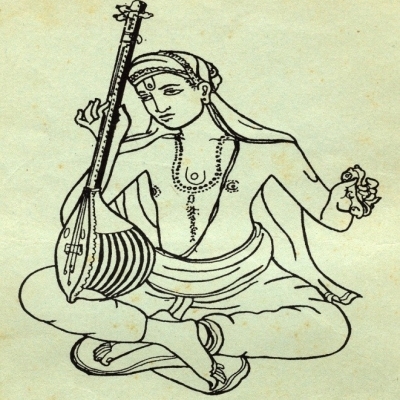 Prachaya was the fourth lower note to Anudatta and this formed a tetra chord called Swarantara. The tetra chord was supplemented with three more notes and the group of seven swaras was named Yamas. Thus the full scale with seven notes evolved and were named in the descending order of pitch- Krishta, Prathama, Dwiteeya, Triteeya, Chaturtha, Mandra and Atiswaarya. The Saama veda hymns were recited from five to seven notes. In due course of time the idea of Sthayi (octave) was conceived and the new names replaced the old names of Yamas. The new names Shadja, Rishabha, Gandhara, Madhyama, Panchama, Dhaivata and Nishada were assigned solfa names Sa, Ri, Ga Ma, Pa, Da, Ni respectively and was called Saama saptaka. The earliest music was the sacred music called the Sāman chants. Various musical instruments like Veena (string instrument), Dundubhi, Bheri (percussion instrument), Shankha (wind instrument) were used as accompaniments during Vedic rituals. The transition of Vedic chant to song was a slow process. Saama gaana was adorned with trills and graces. The Saama saptaka gave birth to Shadja grama the primordial scale. Apart from Vedas references of music are amply found in Pratishakhyas, Brahmanas, Upanishads, Shikshas and Aranyakas. Puranas (epics) like Markandeya purana, Harivamsha, Vayu purana, Vishnu purana and many more mention about music. Great works like Ramayana and Mahabharata have references of music like raagas, vaadyas (instruments), taalas, rendering songs in different speeds and musicians. Lava and Kusha the children of Raama sang Ramayana melodiously in the latter’s court. Raavana the demon King of Ramayana is a said to be a great veena player. 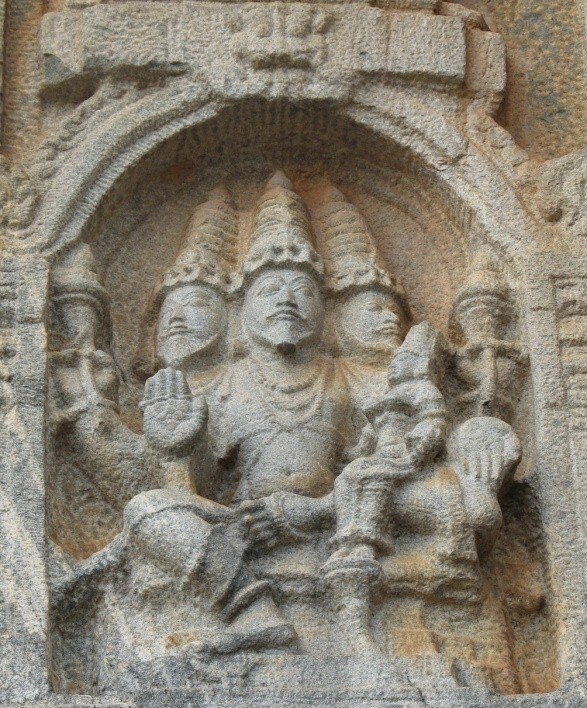 Raavana the demon with ten heads was compressed under Mount Kailash. He sang Saama Veda playing Veena and pleased lord Shiva and Parvati who were seated on the mountain released him. Mahabharata mentions three types of music- music of Gods, music of rich people mainly patronised by Kings and music of common people. In Bhaagavata lord Krishna played flute. Apart from Sa and Pa which are called Prakriti swaras (notes which does not take variations), rest of the five notes Ri, Ga, Ma, Da and Ni called Vikrita swaras take two variations each thus producing twelve notes in an octave. The lower variety with lesser frequency is termed mridu (soft) or komal and the note with higher frequency tikshna (sharp) or teevra. The variations are denoted by solfa notes with numerical numbers in sub script. These 12 notes of an octave again gave birth to 22 Srutis or Microtones. It is the usage of these srutis which make Indian music special and have an individual status. It is difficult to notate Indian music as notations provide only the outline of a composition, but the actual melody of the music can be well expressed only by the usage of these minute divisions or srutis. Music is comprised of Sruti (pitch), Raaga (melody), Taala (rythm), Laya (tempo), Saahitya (lyrics), Bhaava (emotion), Gamaka (grace or ornamentation). Any musical rendering should have a perfect blending of all these features. A quartertone or a microtone is also called Sruti. It is the usage of these micro tones that makes Indian music so special and unique. The transition of Vedic chant to song was a slow process. Saama gaana was adorned with trills and graces. Scales were expanded by a method called Graha bheda (Model shift of tonic) which resulted in getting new scales or melodies. Many were the treatises which mentions about the development of music. Natya shastra the monumental treatise written approximately between 2nd century BCE and 2nd century CE by Bharata covers all aspects of Indian drama, dance and music. Indian music had developed well by then in the aspects of melody, rhythm, instruments and orcheshtra. The treatises Naradiya shiksha by Narada, Kashyapa’s Kashyapa, Kohala’s Sangeeta meru, Dattila muni’s Dattilam, Nandikeshwara’s Bharatarnava are some important that have contributed in tracing the development of Indian music. There are sufficient references about the sangeeta acharyas (music preceptors) like Anjaneya, Shardula, Durgashakti, Yashtika, Kirtidhara, Kambala and Ashwatthara. Silappadikaram which speaks about music exhaustively is a classic in Tamil written in 2nd century CE by King Illango Adigal belonging to Chera royalty. During medieval period music was spread among common people and became more secular in nature. The advent of Raaga was a major milestone in the evolution of music. Matanga muni of 8th – 9th CE the author of the treatise Brihaddeshi defined raaga in an exquisite manner- that with the special combination of sounds beautified by colourful notes which charm the hearts of people is a raaga. During 7th – 8th century CE philosophers and religious teachers composed simple songs in the regional languages. 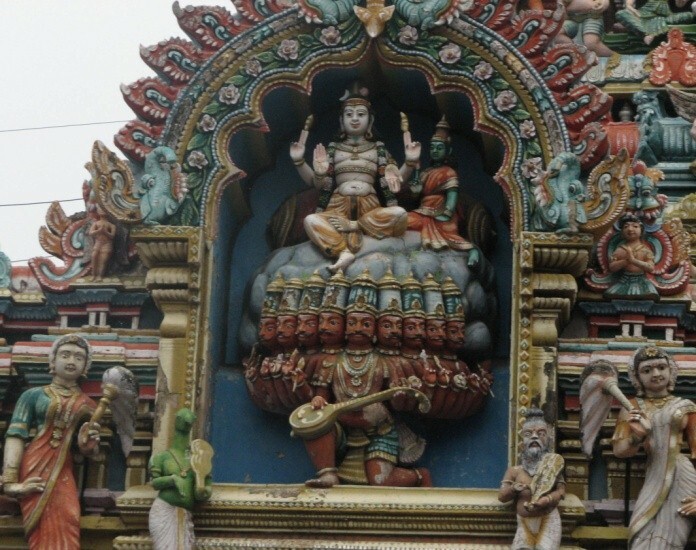 Tevarams and Naalaayira Divya prabandhams of Shaiva and Vaishnava saints composed in Tamil can be recorded as one of the earliest forms of practical music in regional languages. Tevarams were composed by Tirugnanasambandhar, Appar also called Tirunavukkarasar and Sundarar or Sundaramurthy. 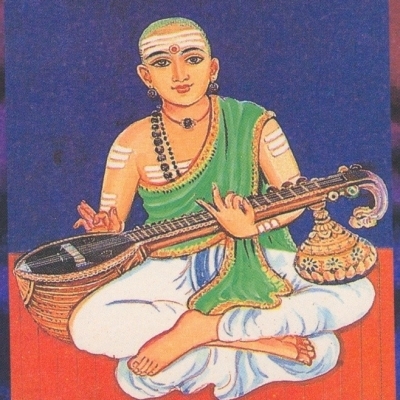 Naalaayira Divya prabandhams were composed by twelve Alvars– Poigai Alvar, Bhoothathalvar, Peyalvar, Thirumalisai Alvar, Nammalvar, Madhurakavi Alvar, Kulasekara Alvar, Periyalvar, Andal, Thondaradippodi Alvar, Thiruppan Alvar and Thirumangai Alvar. 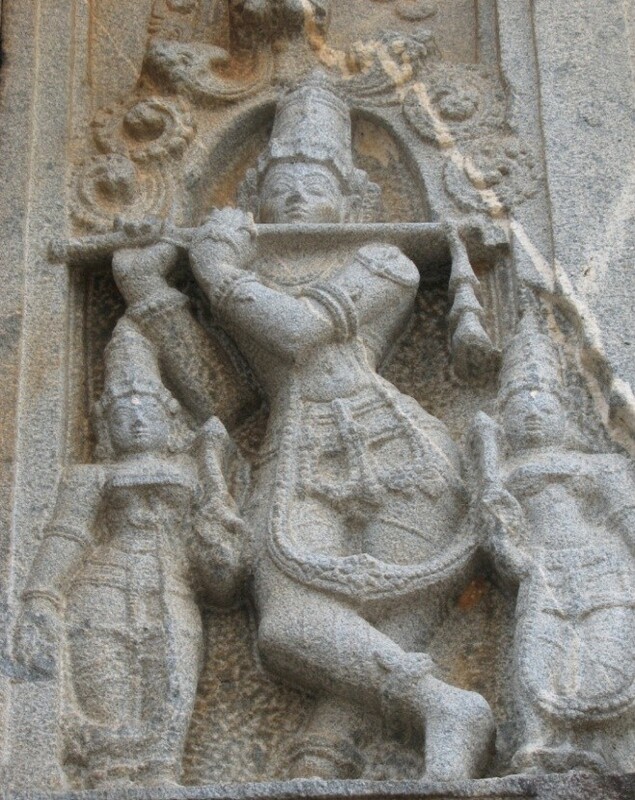 The Pallava King Mahendravarman of 6th century CE was well versed in playing Veena. He got a musical inscription carved on huge boulders in Kudumiyamalai situated in Pudukkottai district, Tamilnadu. 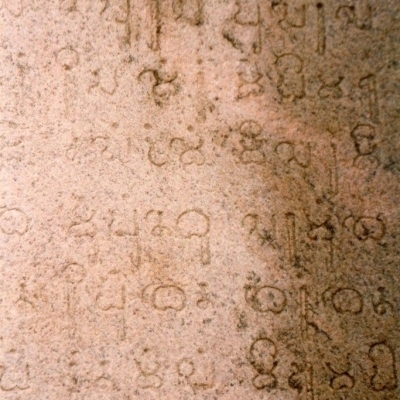 Kudumiyamalai inscription which highlights the music prevailed during that era is believed to be one of the oldest inscriptions on music. 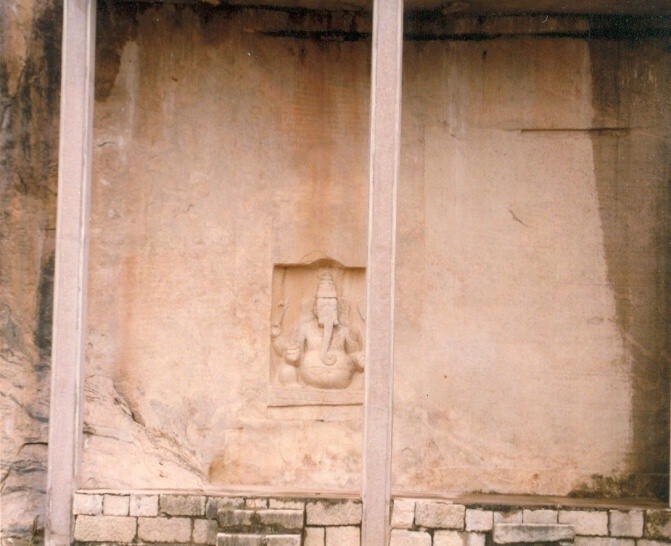 Musical notes have been carved on either sides of lord Ganesha. The Raaga concept is the most important aspect of Indian music. Every raaga has an aesthetic expression and a tonal personality. This aesthetic expression is the Bhaava which is the life of a raga. One more essential part of Indian music is the usage of Gamakas which are used as ornaments to beautify the ragas. 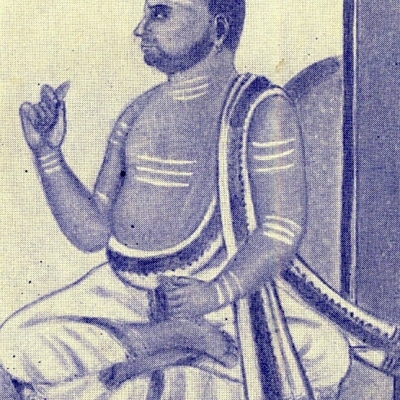 Someshwara Bhullokamal the ruler of Deccan in the early 12th century who authored the treatise Manasollasa called the music of South India as Karnataka Sangeeta. Astonishingly even after eight centuries the same name is being continued for South Indian music. One of the greatest works during early 13th century was that of Sarangadeva who wrote the treatise Sangeeta Ratnakara. This treatise deals with almost all aspects of music like raagas; taalas; rasas (essence); the compositional forms Prabandhas; instruments their practice and performances; physics, physiology and psychology of music. This treatise became a guiding lamp to the present music system. Indian music which had its origin from Saama Veda prevailed in the whole country as one music system till 13th century CE. The beginning of Islamic rule in the northern parts of India not only influenced on the political front but also resulted in the cultural exchanges. With the influence of Persian music in northern part of the country, Indian music got bifurcated into North Indian and South Indian music. 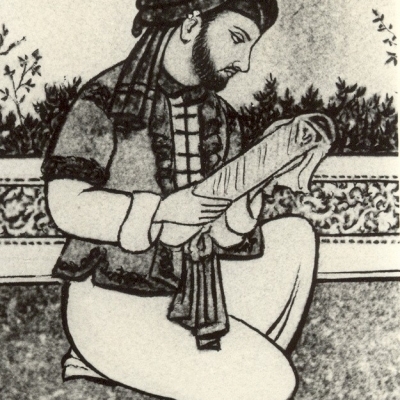 The most popular poet and musician Amir Khusro served the Sultans of Slave dynasty. It is believed that under Amir Khusro’s influence, Indian music absorbed many features of Persian music in North India and this branched off into North Indian or Hindustani music and South Indian music or Karnatak music systems. There were treatises authored by great scholars who highlighted the features of both systems of Indian music and it was progressing simultaneously on the practical front also. 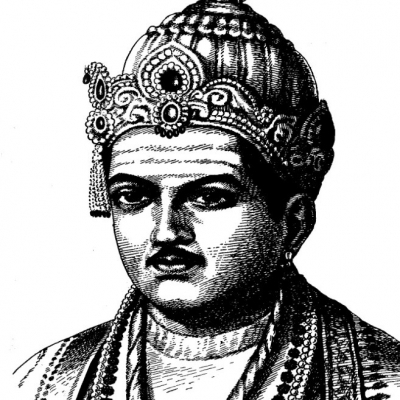 Gita Govinda one of the earliest available evidences of Indian operas was composed by Jayadeva of 12th century CE. The story revolves on the love play of Radha and Krishna on the surface level. But it actually shows the deep philosophy of Jeevatma (the individual soul) pining for surrendering to Paramatma (the God). Gita Govinda which is in Sanskrit consists of twelve chapters divided into twenty four cantos and each canto consists of eight couplets called Ashatapadis. These ashtapadis are sung and danced all over India even to this day. Indian Music witnessed a revolution from 12th century onwards with the rise of bhakti cult. The compositions which were in Sanskrit language till then, were brought out in their respective regional languages. The core of Veda and Upanishads that had an access to only one set of intellectuals, were made available to common people. Scholars and philosophers embedded the essence of these scriptures in simple songs composed in regional languages like Hindi, Tamil, Kannada, Marati, Telugu, Bengali and other Indian languages. In the region of Karnataka, scholars who followed Shaivism (lord Shiva pantheon) composed thousands of simple songs in Kannada called Vachanas meaning that which is said. The lyrical core of these vachanas is upanishadic values and social reformation. 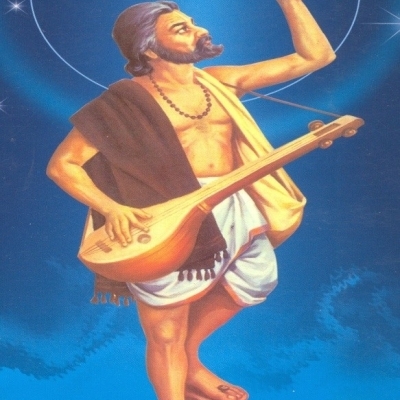 The composers of vachanas were called Shivasharanas. Devara Daasimiah, Basavanna, Akkamahadevi, Allamaprabhu, Amugi Raayamma, Maadara Chennaih and Sarvajna are some of them who have contributed to the Kannada literature as well as music. The Philosophers and composers who followed Vaishnavism (lord Vishnu pantheon) were called Haridaasas. Their works which were composed in Kannada come under the broad heading Dasaa sahitya. 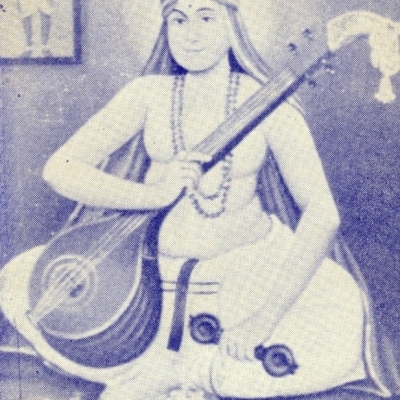 Narahari Teertha was the first composer among Haridasas. Narahari Teertha was followed by a row of Haridasas like Sripadaraya, Vyasaraya, Vadiraja, Purandaradasa, Kanakadasa, Vijayadasa, Jagannathadasa and others Daasa sahitya reached its peak during 15th and 16th centuries especially in the ruling period of the emperor Krishnadevaraya of Vijayanagar dynasty. The musical forms composed by these Haridaasas comprised of thousands of Kirtanas also called Padas or Devaranamas, Suladis, Ugabhogas, and Vrittanamas, thus contributing significantly to practical music. Purandaradasa’s magnificent contribution to the field of music earned him the title Karnataka Sangeeta Pitamaha. It is believed that he has composed in thousands, but the available compositions are only few hundreds. He felt the need for a strong basis for music education, and composed an extraordinary system of exercises with Sarale, Janti, Alankara and Pillari Geethe which are followed by the music teachers even to this day as basic lessons. Tallapakam Annamacharya’s Padas, Chaitanya Maha Prabhu’s Sankirtans in Bengal became popular. The period of post 15th century pulsated with a new spirit and an enlarged vision. This era contributed more towards the practical side but strictly adhering to the shastra or guidelines mentioned in the treatises. Bhakti movement which took its birth in the previous eras swept throughout India in the post 15th century. Great devotees like Vallabhacharya, Surdas, Meera Bai, Kabirdas, Tulsidas and Haridas Goswami Baiju composed hundreds of Kirtans which were mainly sung in central and northern parts of India. Bhajans in Marati language called Abhangs were composed by Saints like Namdev, Dhyaneshwar, Eknath and Tukaram. Akbar one of the Mughal emperors patronised many artists in his court. According to Ain-i-Akbari, a work which documents the administration of Emperor Akbar, there were thirty six musicians including Tansen who adorned the court. Swamy Haridas a devotee of lord Krishna, said to be the music teacher of Tansen, has many compositions to his credit. Pundarika Vittala the author of the treatises Sadraga Chandrodaya, Ragamanjari and Ragamala was invited by Akbar to Delhi. Pundarika Vittala a south Indian who was an exponent in both Karnataka and Hindustani styles of music was appreciated by Akbar so much that he performed the golden Tulabhara which means weighing Pundarika Vittala against gold and bestowed upon him the title Akabariya Kalidasa. Music that is set to taala (time measure) is called Nibaddha sangeeta and not set to taala is Anibaddha sangeeta. As Chandas (meter) is to Padya (poetry), Taala is to Sangeeta. All musical compositions other than raagas sung as aalaapana are set to taala. Each and every taala has its own aesthetic uniqueness. Ancient granthas mention 108 taalas but very few talas are used now in both the music systems- Karnataka and Hindustani. Taalas are illustrated by hand gestures- counting fingers, striking of one hand over other or striking the hand on the lap, and waving off the hand. Modern period witnesses a systematic development in raaga system. Seventy two Melas or Janaka raagas (parent ragas) in the Karnatak music system formulated by the great scholar Venkatamakhi followed by ten Thaats system in Hindustani music conceived by Vishnu Narayan Bhatkande were one of the major contributions of modern period. Thousands of compositions were composed in these janya (derived) and janaka ragas in both the systems. The great composers of karnatak music- Shyama Shastry, Thyagaraja and Muthuswamy Dikshitar composed hundreds of Kritis- a compositional form which happens to be the nucleus of karnatak music. Karnatak and Hindustani musicians go through a systematic training. They begin their musical journey by practicing the preliminary exercises which helps a musician to understand the placements of the swara, raaga and taala. These swaras will be in ascending and descending order and are practised in different speeds. They are tuned to raaga Mayamalavagowla in karnatak music and raaga Bilaval in Hindustani style and the taala being set to eight beats and its multiples. The training begins with Sarale varise or Sargam which are simple sa ri ga ma phrases in different combinations; Janti varise means dual notes like sasa riri gaga mama in different patterns; Dhatu varise has jumping or alternate notes sa ga, ri ma, ga pa; Hecchu sthayi varises has higher octave notes and Taggu sthayi varises has lower octave notes. The exercises which were in eight beats up to this level will be graded to different taalas. These exercises with beautiful permutations and combinations are set to three, four, five, six, seven, nine, ten and goes on… For a thorough grounding in the Indian classical music, one has to practice these preliminary exercises in different raagas and speeds. Taana– raaga exposition with a uniform tempo and with the phrases anamta, taanamta …. Keertana, Vachana, Bhajan, Devaranama and Abhangs are sung by both Karnatak and Hindustani musicians. Navarasas (nine essences) – Rasa is that which is felt by the mind and the expression of the feeling experienced by an artist or the audience. A performance without the portrayal of rasa is insipid. Every rasa has its own expression and each composition will be composed in either one or more rasas as per the requirement of saahitya and raaga. Shringaara rasa or Love which is called the Rasaraja or King of rasas which portrays expressions like love in proximity, separation, loss, expectation, pursuit, quarrel, meeting and re union. Veera rasa (Valour); Karunaa rasa (Pathos); Roudra rasa (fury); Haasya rasa (Humour); Bhayaanaka rasa (fear); Bheebhatsa rasa (disgust), Adbhuta rasa (wonder) and Shaanta rasa (peace). In addition there are three upa rasas namely Vaatsalya (affection), Bhakti (devotion) and Gaana (musical aesthetics). Bhakti and Gaana rasas are present in all the musical compositions. A Composer of the musical pieces called Vaggeyakaara should be well versed in many fields. He should be knowledgeable in theory and practice of music, veda and upanishads for composing lyrics and command over the literatures of different languages. Indian music is an essential part of different art forms like Dance, Drama, Geya Natakas (operas), Kathakalakshepams or Katha keertans, Yakshaganas and Bhagavata Mela Natakas. Though the origin of Karnatak and Hindustani music systems are one and the same, the bifurcation brought lots of changes in the styles of rendering. Hindustani music was influenced by the Persian music which resulted in adapting some of the latter’s nuances. Thus Hindustani music acquired a distinctive style of its own. On the contrary Karnatak music which prevailed in southern part of India continued to adhere to the ancient and traditional principles as referred in the Vedic scriptures. Many musicians, composers and authors have contributed profusely and have made Indian music culturally very rich. This treasure was safely guarded and enriched by the Kings who ruled India in different eras. These are preserved and passed on to the posterity through temple architectures, inscriptions, treatises and above all patronising the musicians.